One of the most important developments since the inception of Yoga & Health 37 years ago, occurred this month when Yoga & Health launched its first digital version of the magazine available from www.exacteditions.com, where you will also find a FREE trial of the magazine. For a preview of December’s edition, please click on the above link. 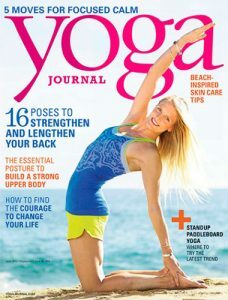 The e-version of Yoga & Health will be available either as an annual subscription or as single issues. A number of digital version of back issues will also be made available online. It’s This means that readers worldwide will have easy access. If you haven’t yet decided on a present for friends and family, why not consider this perfect ecofriendly gift for Yoga enthusiasts everywhere? A free Yoga & Health app for ipad and iphone users is available from the itunes store. The festive season can give rise to all kinds of stresses and strains. Additional demands on time, energy and finances, coupled with seasonal bugs and, for many, long distance travel to visit family and loved ones, can leave both body and mind in not the best shape to celebrate. In this issue, Seema offers a simple stretch sequence to relax and restore, while we have articles on how sound can have remarkable benefits both physically and psychologically for all ages. Mantra repetition has been shown to slow respiratory rate, activating the parasympathetic nervous system and even the arterial bar reflex, of benefit to cardiac patients. Children with autism and ADHD have also shown marked improvement after sessions using chant and music. While such benefits have long been known subjectively, sophisticated modern machinery can now offer scientific proof. Meditation, combined with Yoga, therapies and healthy lifestyle, offers an effective drug free solution to all kinds of stress and strain, including in hospitals for both medical staff and patients, as movingly described by Rodney Yee. While relaxation is a very beneficial outcome of many meditation techniques, the mental space created can be used to analyse more deeply the origins of stress for a longer term solution. This month, Mr Iyengar, one of the pioneers of Yoga in the West, will celebrate his 94th birthday. On behalf of all of us at Yoga & Health, we wish him many happy, healthy years of practice ahead.